This charming 19th century estate cottage has been sympathetically renovated, combining original features and traditional Highland décor with contemporary elements, resulting in a cosy and exceptionally stylish holiday property. The open-plan ground floor features a comfortable sitting area with wood-burning stove (logs supplied), a sleek kitchen with stone worktops and dining area. Off the kitchen there's the a warm boot room with pulley for drying wet outdoor gear and a shower room with WC just off. Upstairs, a stunning reclaimed rolltop bath sits alongside a modern separate shower. There are two equal size elegant double bedrooms with views over the glen with very comfortable Hypnos beds (zip link), feather duvets and crisp cotton bedlinen. Little touches include a file of self-guided walks, a wall mounted map of the region and fresh flowers. There's a large fully enclosed private garden to the rear with a little waterfall and stream plus swings and a tree house for children. These two charming and exceptionally comfortable holiday homes are situated on a beautiful family run Highland Perthshire estate called Straloch. 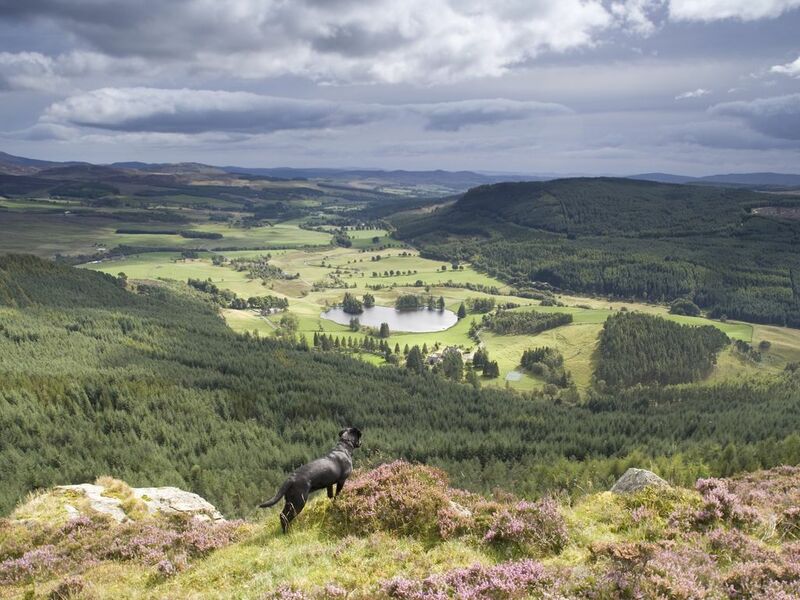 On the southern fringe of the Cairngorm National Park, Straloch has a particularly stunning location overlooking a loch with rugged mountain backdrop and views down the gently rolling glen of Strathardle. For peace and tranquility it’s hard to beat, yet although it feels remote it’s only 15 minutes from the small town of Pitlochry and well placed for touring Scotland. Both houses are beautifully warm and have been designed with a discerning eye for style and comfort. We believe it’s the simple luxuries that make the difference, so you’ll find crisp cotton sheets, feather duvets, thick quality towels, underfloor heating in the bathrooms and organic bath soaps and shower gels. Each house also has a warm boot room with storage for outdoor gear and drying facilities. The architect designed newly built Stalker's Lodge sleeps 6 (3 bedrooms, 2 bathrooms) and has generous living space with sleek modern kitchen with stone work tops, sitting/ dining room and further sitting room in glass extension with glorious views over the rolling fields and the glen beyond. The bedrooms all have zip link beds so can be made up as superking doubles or singles. One of the bathrooms is ensuite (shower only). The other bathroom has a bath and separate shower. The recently renovated Keeper's Cottage sleeps 4 (2 bedrooms, 2 bathrooms) and has a more traditional feel, reflecting its 19th century origins. The open plan ground floor features a modern kitchen and a cosy sitting room with wood burning stove, comfortable leather chairs and soft tweed curtains. There's a boot room to the rear and a shower room. Upstairs there are two spacious double bedrooms with designer wallpaper and a bathroom with a stunning reclaimed roll top bath and separate shower. Both the bedrooms have zip link beds so can be made up as superking doubles or singles. The houses can be rented together, providing accommodation for ten across the two properties - ideal for families holidaying together or larger family parties of all ages. Each house has its own fenced garden offering security and privacy from each other, and both have children's play frames with swings and slide, outdoor seating areas, barbecue and lockable bike sheds. There’s also the added bonus of a heated games room which has a pool table, table tennis and darts, perfect for rainy days and evening entertainment. Both properties are extremely warm and energy efficient with heating and hot water supplied by a biomass boiler that run off waste timber from the estate forestry. There’s masses to do on the estate from walking and mountain biking, to fishing and tennis. We supply a file of self-guided walks which range from gentle strolls around the loch or Millennium Wood to more demanding upland yomps in the heather hills with fabulous views. Families are particularly welcome at Straloch. Children love cycling up and down the quiet estate roads, exploring the Walled Garden and toasting marsh mallows on the island. There are games and children’s books in the houses, as well as a big box of Lego and Playmobil on request. We can also supply travel cots, high chairs and even an all terrain pram! We’re dog friendly too - up to two well behaved dogs are welcome, subject to house rules. Dogs must be on leads around livestock but can can be exercised freely off the lead in the nearby 5 acre Millennium Wood. Lucy was brought up on Straloch - her parents bought the place in the 1960s - and is passionate about its countryside, nature and wildlife. With these two new holiday properties, she is delighted to be able to share her beautiful family home with others. She lives on the estate with her family and (if free) she's more than happy to organise guided nature walks and picnics around the estate. If it's peace and tranquility you're after, look no further. There are many beautiful places in Scotland but Straloch seems to have a special atmosphere about it that people really love. The scenery is exceptionally beautiful and the loch and the birds that live on it have a lovely calming effect. Wildlife abounds and in the spring and summer the air is full of birdsong - the perfect antidote to stress. The wildflowers in season are lovely, with many unusual heathland varieties, including orchids (see our website for more information). It's also well positioned for sightseeing as, although it feels wonderfully remote, Straloch is only 15 minutes' drive from Scotland's main north-south trunk road, the A9, making it the perfect for day trips. The accommodation is unusually stylish and comfortable. The showers are great. The towels are fluffy and the sheets are crisp. The outlook is lovely. The gardens are attractive and private. You have 3,000 acres to yourself to explore. There's a rowing boat on the loch and a tennis court plus a games room for rainy days with pool table, table tennis and darts. Activities for children can be arranged, such as nature treasure hunts and pond dipping. Gourmet picnics can be arranged. Bathroom 1, upstairs, features a vintage roll top bath and a separate shower with modern fittings. Heated towel rail. Bathroom 2, downstairs off the boot room, has a shower and WC. Heated towel rail. Both bathrooms have luxurious handmade organic soaps, shower gel and hair conditioner by The Highland Soap Company. To the rear of the house there is nothing but heather covered hills and mountains for miles. You can walk up a track and be in the mountains in 10 minutes. The house is situated in a very pretty glen with lovely views. The nearest shop or pub is Kirkmichael (4 miles) or Pitlochry (8 miles) so a car is essential. There is loch which is visible from the house with rowing boat and kayaks which are available for your use. Fishing for wild brown trout by arrangement (fly fishing only). Shared with the house next door. There is a pool table, table tennis and darts board. Private garden with small stream running through it so small children need to be supervised. The garden is fenced. Dogs can be exercised off the lead in the nearby 5 acre fenced Millennium Wood. 3 sit-on kayaks are available for use on the loch: 1 double and 2 singles. Buoyancy aids are provided and must be worn. Guests use the kayaks at their own risk. Bicycles of all sizes can be borrowed but at users' own risk. There is a lockable bike shed. Children love cycling along the quiet back drive. The area is good for mountain biking. Sturdy rowing boat available on the loch. Buoyancy aids are available and must be worn. Private sunny terrace next to a little stream. All weather hard court, shared by both holiday houses and the owners. Balls and racquets available. Soft soled shoes must be worn. There is a heated games room with pool table, table tennis and darts. It is shared with the other holiday house. Up to two dogs welcome, by arrangement. Dogs are not allowed in the bedrooms or on sofas and must sleep in the boot room. Dogs must be kept on leads around livestock but can be exercised freely in the 5 acre Millennium Wood which is deer fenced. There is a lockable bike shed at the property. We have bikes you can borrow - please enquire. Exceeded expectations in every way! Luxury accommodations. Straloch Estate was a dream to visit. The attention to detail in the design of Keeper’s Cottage was truly exceptional. A sparkling clean designer kitchen, lovely furnishings, soothing and feminine bedrooms, a vintage soaker tub and the stunning views made for a romantic country getaway. Lucy made sure we had all the necessary information to explore the area as well as the 3000 acre estate. My husband and I enjoyed walks around the loch while watching swans, birds and grazing sheep against a backdrop of mountain scenery. The nights were cozy with roaring fires and magical views of the Milky Way. We are already planning a return visit. Thanks for that very lovely review and evocative descriptions! So glad you had such a good time and we look forward to seeing you again. From the moment you turn into the long and winding estate driveway, to the time you turn the key and walk into the beautifully finished stone cottage, you can't fail to be impressed by its charm and loveliness. Gorgeous surroundings, even though stairgates for our toddler were not provided in time but the owner did her best to resolve this. Sadly no WiFi was available and my wife had to purchase additional mobile data as she had to work during our stay, which was at considerable cost. Overall, a lovely stay. Thanks so much for your kind comments - so glad to hear you enjoyed your stay. See you again another time I hope! Great stay at Keepers cottage. Beautifully equipped cottage with amazing views. Ideal for dogs with great walks from the doorstep. We took lunch up to the Bothy which was very special. We only had time for a three night stay but will definitely be booking again as lots yet to explore. Lovely to hear you and the dogs enjoyed your break at Straloch. Look forward to seeing you again for longer next time! It’s a special place. We came again as the children loved it so much. Hillwalking - You're spoilt for choice around here, from famous Munros such as Ben Lawers, Schiehallion and our local Beinn a' Ghlò, to the less strenuous but no less scenic Ben Vrackie above Pitlochry. A local guide may be arranged with advance notice. Castles & Culture - Blair Castle, Glamis Castle and Scone Palace, three of Scotland's most famous landmarks, are all within easy reach, each fascinating in their own way. Art lovers will relish the Fergusson Gallery in Perth which houses the largest collection of paintings by the famous Scottish Colourist, J D Fergusson. There's Pitlochry Theatre and nearby Aberfeldy is an artistic hub, with several independent art galleries and craft shops. The charming and ancient small town of Dunkeld is a lovely day trip, featuring the famous Cathedral on the beautiful banks of the River Tay, good shops and places to eat. It's also a great place to walk with a popular network of walking paths in to suit all abilities. Highland Games - a big attraction during the summer months and a must-do if you're on holiday at this time. Our local games, the Strathardle Highland Gathering is small but delightfully traditional and great fun, with plenty of entertaining things that everyone can take part in, such as 'Tilt the Bucket' and 'Musical Cars', as well as the usual caber tossing, hammer throwing and Highland Dancing (held on the 3rd Saturday in August annually www.strathardlehighlandgames.org.uk). Alternatively there's the Atholl Highland Games at Blair Castle in May, featuring the spectacular Atholl Highlander's Parade, or the larger Pitlochry Highland Games in September. Golf - there is plenty to amuse and challenge golfers of all standards nearby, including the scenic and challenging Pitlochry Course, the famous Rosemount Course in Blairgowrie and Scotland's highest golf course at Dalmunzie, up towards Glenshee. Gleneagles itself is only an hour's drive away and Saint Andrews is in striking distance too, being an 1 hour 30 minutes away. Skiing & Mountain Biking - Glenshee, Scotland's biggest ski resort, is only 30 minutes drive. It is also a good place for high alpine walks in the summer and has several challenging mountain bike trails which are accessed by one of the ski lifts (www.ski-glenshee.co.uk). The Enchanted Forest - Visit the award winning 'Enchanted Forest' in Pitlochry during October, a night time walk with spectacular light and sound effects (www.enchantedforest.org.uk). High quality cotton bed linen and towels are provided. We also supply hand soap, luxury shower gel, bin bags, washing up liquid and cloths, dishwasher tabs and loo paper. The kitchen has basic herbs, salt and pepper but you need to bring all other groceries. The kitchen is well equipped - please refer to inventory on the Tenants' Notes - these available on the Hospitality Section or can be emailed to you in advance on request, along with directions, access instructions and suggestions about things to do in the local area.